RIVERSIDE, Calif. — www.ucr.edu — Graduating UC Riverside senior Amy Avelar has three boys, a knack for making new molecules and a highly competitive 2005 National Science Foundation Graduate Research Fellowship worth $90,000 over three years. As an NSF Graduate Research Scholar, Avelar will pursue her Ph.D. at UCR, conducting research on carborane acids, known as “superacids” for their strength. They hold great promise in improving the quality and octane rating of gasoline, developing polymers and synthesizing pharmaceuticals. “Amy represents one of the things we do best at UCR — finding talent in traditionally underrepresented groups of students and turning them on to a love of learning and discovery,” said Christopher Reed, Distinguished Professor of Chemistry, in whose lab Avelar works. Avelar is studying ways to get carborane superacids into liquid form under manageable temperatures in order to make them more useful and easier to study. Avelar took the not-so-usual route to reach her graduate studies. After graduating from Sierra High School in San Bernardino in 1997, she got married, attended San Bernardino Valley College, and started a family. Soon afterward she took a year and a half off from her studies to work, but missed school and returned to community college. In 2003, she graduated form San Bernardino Valley College with an associate’s degree in chemistry, transferred to UCR and qualified for the Minority Access to Research Careers (MARC U*STAR) program, which helped finance her studies. At 25, Avelar manages her research with family life, which includes husband Alvaro and their three boys, ages 8, 3 and 1. “My mother-in-law watches the children while I am at school,” she said. “That she could be the mother of three children, do research, get As in all her classes, and be a wonderfully together person is remarkable,” Reed said. Avelar plans on pursuing a Ph.D. in chemistry and finding a job as a researcher in the chemical industry or as a college professor. 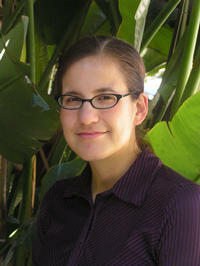 Avelar is the sixth NSF Graduate Research Fellowship holder at UCR since 2000. They include Michael Vredevoogd, geological sciences, 2004; Pesach Lubinsky, plant biology, 2003; Reiko Ishihara, anthropology, 2002; Sonia Zarate, plant biology, 2002; and Curtis Adams, biology, 2000.